Villagers in Singrauli, India, stand at the bottom of a coal mine dump site, next to their only water source -- a natural spring that now bubbles out of the dump. Photo by Gayathri Vaidyanathan. 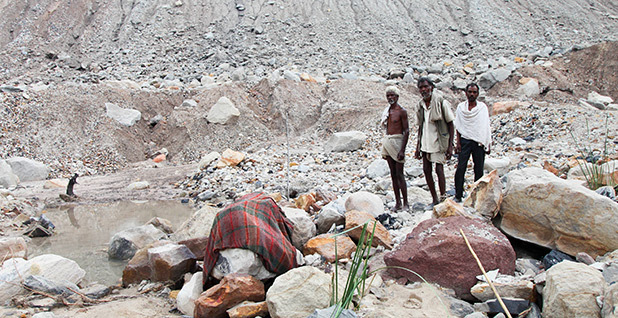 SINGRAULI, India -- Here at the foot of a mountain of coal mining debris live 150 people in one of the most polluted places on Earth. The air is dense with coal dust and other particulates. The drinking water source is a spring that emerges from the coal dump. When the rains come, landslides from the rock pile threaten to crush the small mud homes at its foot. Kunti Baiga, who is 25 or 30 years old by her best reckoning, lives there with her kids -- two boys and a girl. The coal mining company, Northern Coalfields Ltd., has offered her family a spot in a resettlement camp nearby. But she refuses to move because she has seen the miserable conditions there. "We would rather be crushed by the debris here rather than under the roof of those houses," she said. "I would rather die here." The coal boom is meant to power India's economic growth and supply the 400 million people like Baiga who do not have electricity. Indeed, India sees its energy mix as inextricably linked to coal. Electricity demand is estimated to double by 2022 nationwide, and coal production is expected to double to 1 billion metric tons by then. Much of it would be burned in carbon-spewing power plants to generate an additional 103 gigawatts of capacity. 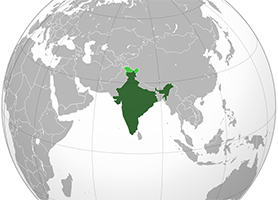 India is already the world's fourth-largest emitter of carbon dioxide after China, the United States and the European Union, releasing more than 2 billion metric tons in 2013. By 2030, emissions are projected to rise to between 4 billion and 5.6 billion metric tons, according to modeling studies. Government leaders are unapologetic about India's right to pollute, just as other nations have done in the quest for prosperity. "We need carbon space, please vacate the carbon space which countries have occupied," Prakash Javadekar, India's environment minister, said in a recent interview. "We want free carbon space where our development can be parked. We want to bring them [poor people] out of poverty. ... And to that end, we'll produce more energy." And yet, in India's race to develop, people like Baiga get left out. Priya Pillai, 37, a senior campaigner with Greenpeace India, has come as close as anyone to challenging the government's position that coal-powered development helps the poor. She believes that is why, on Jan. 11, as she was boarding a flight to London to talk to British ministers about coal extraction in India, she was stopped. In the coming months, Greenpeace would be targeted as an enemy of the state, its bank accounts would be frozen, and it would be forced to fight in the courts for its survival. But that January morning, Pillai was alone. She was directed to a holding area. Pillai does not have a criminal record, but she said she felt the grip of paranoia. Her suitcase had already been checked in, and she felt convinced that the authorities would put drugs in her bags and arrest her on a false charge. Her fear was the culmination of five years she had spent organizing villagers in Singrauli to protest against coal mining. The region, in central India's Madhya Pradesh state, is so remote that it takes a day's travel from Delhi to reach it. Residents there do not know what is owed them by the government, as it takes away land and awards it to India's biggest energy companies to generate coal-fired electricity and power distant megacities, advocates say. That was the case when Pillai got there in 2011. One morning, she hired a sedan and drove to a village near the Mahan forest, which was slated for destruction. On both sides of the road were houses and farms dotted with cows. To the southeast loomed a 1,200-megawatt power plant built by the Essar Group, an Indian multinational conglomerate. The plant had cost the company 3,600 crore rupees ($550 million). Four villages had already been displaced. Essar and its partner company, Hindalco Industries Ltd., wanted to move two other villages to mine coal to supply the power plant. The mine would destroy 967 hectares of the Mahan forest. Mahan was strategically ideal for Greenpeace, which was looking for a cause to spark a nationwide anti-coal movement. The fight would pit villagers against the might of the government and a mega-energy company, Essar, which was then listed on the London Stock Exchange. Greenpeace set up its India office in 2002, and since then, it has grown to have the largest on-the-ground presence of all international environmental groups that focus on climate change issues. Greenpeace's goal in India is to stop all new coal-fired power plants because the resulting carbon emissions would contribute to global warming, even though scientists caution that renewable energy has not yet matured enough to supplant future coal-fired generation. "For us, as an environmental organization, it is important that coal remains below the Earth, it is not dug up and it is not burnt," Pillai said. Activists urging fossil fuel divestment have a list of the top 200 companies to target, and Coal India Ltd., the state-owned producer, heads it with a potential 57 gigatons of carbon dioxide emissions in its reserves. 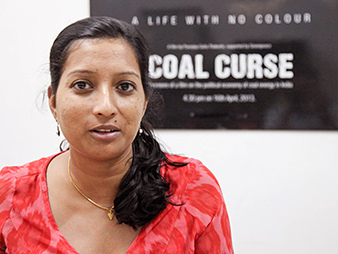 Priya Pillai, a campaigner with Greenpeace India, has been under attack for fighting coal development, which the government considers key to the country’s growth. Photo by Gayathri Vaidyanathan. That's one reason why the Indian government sees the meddling presence of international green groups in the work of Greenpeace India. Greenpeace International, which is involved in divestment campaigns, and U.S.-based ClimateWorks partly fund and train activists with Greenpeace India. Last year, the Intelligence Bureau wrote to then-Prime Minister Manmohan Singh and called the group a threat to "national economic security." "Greenpeace aims to fundamentally change the dynamics of India's energy mix," the report, which was leaked to the media, states. Though India ambitiously plans to generate 175 GW of renewable energy by 2022, modeling studies show that coal would occupy more than half of its energy mix in 2030. Curbing carbon emissions in the next few decades, officials say, is not a reality that the nation can commit to. Indeed, as India's contribution to a new global climate change agreement in Paris in December makes clear, "coal will continue to dominate power generation in [the] future." The Paris targets call for curbing emissions 33 to 35 percent per unit of economic output from 2005 levels by 2030. But there will be no peak year beyond which the country's carbon emissions will start to decline. No country could ask such a thing of India, where the average person uses just 6 percent of electricity as the average American, Javadekar said. The emerging deal in Paris stands in stark contrast to the current Kyoto Protocol, which demands only a handful of wealthy countries curb emissions. India, aligning itself in recent years with major oil producers like Saudi Arabia, has been the staunchest opponent of any effort to force developing countries to undertake mandatory carbon cuts, arguing that wealthy countries have not yet done enough. Many of its Paris targets are conditional on receiving aid. "My people have the right to grow. First is the access to the energy, second is the quality of power," Javadekar said. Virendra Singh, 36, a farmer, was taking his cattle for grazing in 2011 when Pillai's sedan pulled up. She asked him the way to the village chief's house, and then about the coal mine proposed for the region. Did he think the Mahan forest and their village should be saved from Essar? "Our forests must remain if they can," he recalled saying, echoing a widespread sentiment that villagers did not have a say in such matters. Mahan is a 20,000-hectare forest that overlies some of the highest-quality coal in India. It is part of the central coal belt, which stretches across four states and coincidentally contains 36 percent of India's remaining forestland. Activists say a fight against coal in India is a fight to save its forests. 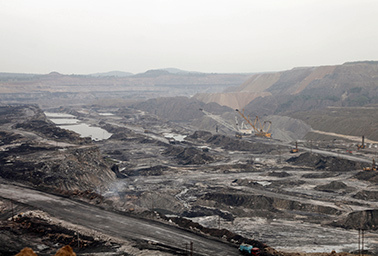 To convert its anti-coal movement into a forests campaign, Greenpeace used the Forest Rights Act, a landmark law enacted in 2006 that allows mining only if a majority of villagers in the area agree to the development. Greenpeace wanted the Mahan villagers to oppose Essar's coal mine, which was in the process of securing permits. Pillai and her colleagues began visiting nearby Budher, a forest hamlet of 165 people where the air is punctuated by the music of cowbells. Essar representatives had told residents their village belonged to the company. Their certainty stemmed from the fait accompli nature of environmental clearances for industrial projects in India, activists said. But Essar had not wagered on Greenpeace and Pillai. At international climate negotiations, Indian leaders point to their rural poor as the raison d'etre for the nation's economic development agenda. "We don't want to keep tribal people always poor," Javadekar told ClimateWire. "We don't want to exhibit them as the poverty of India, we want to bring them on par with our average citizens." Energy production would eventually benefit those communities, "because any economic activity creates more employment, and it benefits the poor more," he said. Yet, it is unclear that they are benefiting. About 75 percent of India's most impoverished citizens live in the countryside, yet electricity flows are lopsided toward urban centers. In rural India, about 134 million families earn less than $2.50 a day, and only half have access to electricity. Rural homes regularly experience rolling blackouts during times of peak demand as utilities move available power to commercial operations and energy-hungry cities. That means the average rural consumer ends up subsidizing power for urban residents by 240 to 510 rupees ($4 to $8) per year, according to a study in Karnataka state done by Rahul Tongia, a fellow at Brookings India. It may not seem high by U.S. standards, but experts note it places an unfair burden on villagers who already live hand to mouth. In Amlohri, Ram Shah Baiga, 22, owns a single incandescent light and gets an electricity bill that is half his monthly earning of 1,000 rupees ($15). The bill is particularly incongruous given that a city resident who owns a refrigerator, ceiling fans and multiple light bulbs would be charged similarly. "Now tell me if this is fair. I only have one bulb in my house," he said. M.V. Ramana, a physicist at Princeton University who has studied energy access in India, said new coal plants might create employment for city dwellers, at the expense of poor people elsewhere. "Is that suffering justified to set up a mall, to air condition a mall?" he asked. Back in Singrauli, Pillai had to show the villagers what was at stake if they did not fight to save the forest. She took them to resettlement colonies for people displaced by coal mining. One such is Amlohri, 20 minutes away, a desolate settlement without roads and electricity. Few people there are regularly employed, said resident Gopi Baiga. He could feed his young daughter only one meal the previous day, he said. India's coal boom is aimed at helping people like Kunti Baiga, a villager in Singrauli, rise out of poverty. But activists say coal is only making rural conditions worse. Photo by Gayathri Vaidyanathan. "Since we moved here, we don't want to continue living," he said. "If a man is starving, there is no peace left for him." Months later, a dozen villagers sat with Pillai and told her they would fight Essar and demand their forest rights. Over the next months, Greenpeace helped organize the resistance. They borrowed heavily from the nonviolence playbook of Mahatma Gandhi and one evening brought a projector to the village to play the Academy Award-winning movie about the Indian independence leader's life. Soon, the villagers who attended the meetings were greeting each other by pumping a fist in the air and shouting, "Zindabad!" or "Victory," a rallying cry of the movement against the British. With Greenpeace's help, the locals prepared an official resolution under the Forest Rights Act to be voted on during a village committee meeting. If it passed and got recognized by the government, the villagers could block the mine. The government watched in alarm. State-level intelligence officials pretended to be villagers and appeared at Greenpeace meetings in Budher to learn their tactics. "Greenpeace has been growing exponentially in terms of reach, impact, volunteers, movements it supports and media influence," the Intelligence Bureau wrote to Singh. "Activists have focused on ways to create obstacles in India's coal-based energy plans and methods to pressure India to use only renewable energy." In January 2014, Pillai and her colleagues gathered 27 villagers and took them to Essar's headquarters in Mumbai, the nation's financial center. The villagers, some whom had never left Singrauli, gaped as six men in tiger costumes jumped off a 23-story glass building and unfurled a banner that read, "We kill forests: Essar." The villagers and 40 Greenpeace activists were arrested, but Mahan made headlines. About 1 million people signed up online in support of the anti-coal movement, according to the group. Two weeks later, the government gave Essar and Hindalco all required clearances to mine coal from Mahan. The public, by then, was deeply angry with the government following a series of corruption scandals. The nation's auditor general had found large irregularities in the awarding of coal blocks -- including Mahan -- to companies in the past decade. The nation had lost 1,860 billion rupees ($31 billion) in revenue, the auditors said. The scandal implicated Essar, Hindalco and other companies. In national elections that April, Indians decisively voted out the ruling government. Prime Minister Narendra Modi won with an absolute majority, which gave him free rein to govern aggressively. Almost immediately, his administration leaked to the media the Intelligence Bureau report, which revealed Greenpeace's foreign funders and made the group unpopular in a nation that was riding a nationalistic wave. India's proposed targets for a new global climate change agreement make clear that coal is here to stay, saying the fossil fuel source will "continue to dominate power generation in [the] future." Photo by Gayathri Vaidyanathan. In September, the nation's Supreme Court canceled most of the mines allocated since 2006, including Mahan, citing the auditor general report. Greenpeace and the villagers in Singrauli declared victory. The Modi administration said it would not offer Mahan up for mining again -- the Greenpeace campaign had made it toxic. But the government also recognized that a repetition of Mahan could be dangerous for India's energy security. The Ministry of Home Affairs, which deals with internal security, acted decisively. It froze Greenpeace India's bank accounts, making it difficult for the group to pay its employees for some months. The group can no longer receive money from foreign donors, including Greenpeace International. The government has alleged that the group did not declare its foreign funding properly. The government has also challenged Greenpeace's status as a nonprofit and canceled its registration in India. It no longer recognizes Greenpeace India as an environmental nongovernmental organization. The group rebuts all charges and is fighting seven cases in court for its survival. The most personal cost of the crackdown was borne by Pillai. Together with other activists, she was placed on a watch list that prevented her from traveling to London to address British parliamentarians in January. Immigration officers stopped her at the airport and stamped her passport with a red "offload" sign. In indignation, she appeared on national television and challenged the legality of the Modi government's actions. Her parents had not known that Pillai was a grass-roots organizer taking on the powerful coal mining interests and the government. They became frantic for her safety. She recalled her father saying, "These people are very powerful; they are a government. They can do anything to you." She brushed off their concerns. Days later, her father, who was an epileptic, suffered a hard fall due to stress. His hip broke in multiple places, and he passed away a month later. "I guess everything has a price," Pillai said. The actions suggest the government is not interested in setting right the environmental and social injustices of coal extraction, which Greenpeace's activists highlighted in Singrauli, said Ramana of Princeton University. There is a large transfer of natural resources -- land, water and forests -- from the poor to corporations in these cases, he said. Other analysts note India must address that reality with its insistence that the country be allowed to emit unchecked carbon in order to benefit the most needy. Javadekar said Greenpeace is in trouble simply because it broke the nation's laws. "We have not gone against anybody. Those who violate the law will have to face the law," he said. "There is a legal process, and they [Greenpeace] have every right to plead their case."